Moody Dunbar Roasted Red Pepper Fire Strip - 102 Oz. Moody Dunbar Roasted Red Pepper Fire Pieces - 102 Oz. Moody Dunbar Fire Roasted Red Pepper - 28 Oz. Moody Dunbar Piaggi Roast Red Bell Pepper Piece - 28 Oz. Moody Dunbar Red and Green Pepper Strip Mix - 102 Oz. Moody Dunbar Diced Red UnPeeled Pimento - 15 Oz. Moody Dunbar Diced Red UnPeeled Pimento - 7 Oz. 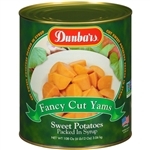 Moody Dunbar Cannon Extra Standard Cut Yams Light Syrup - 108 Oz. Dunbar Diced Peeled Pimientos - 102 oz. Cannon Mixed Green and Red Pepper Strips - 102 Oz. Diced Peeled Pimientos - 28 Oz. Diced Unpeeled Pimientos - 28 Oz. Dunbar Diced Red Sweet Peppers - 28 Oz.